The smallest deeds can be civic acts. Helping a neighbor, punching a ballot, attending a town meeting, or performing community service—all are simple but valuable manifestations of active citizenship that can improve the world around us. Then there are other acts, larger acts, that don’t just bring people together to address a particular issue; they have the power to recover a lost history, to heal profound wounds, and to transform a space of hatred and prejudice into a place of renewed strength and unity. Such is the case with the remarkable project undertaken by Diane O’Donoghue, a Tisch College Faculty Fellow, who recently completed her second term as chair of the Department of Visual and Critical Studies – the Tufts department in affiliation with the School of the Museum of Fine Arts. 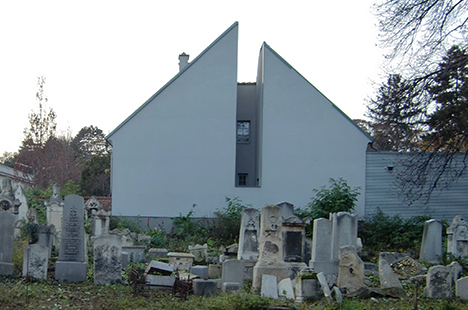 In 2009, O’Donoghue co-founded an organization, registered with the Austrian government, which is devoted to the preservation of the nation’s Jewish cemeteries. A particular focus of her group’s work involves efforts to restore the Währinger Cemetery in Vienna, the city’s oldest surviving Jewish burial site, established in 1754. This large cemetery, once a beautifully landscaped memorial space of 10,000 graves near the center of the city, suffered considerable Nazi-era destruction in the period after the unification of Austria and Germany in 1938, and remained a locus of desecration well after as vandalism continued there in the decades to follow. The large and thriving Jewish communities of Vienna before World War II are now very small in number, with even fewer left who can make descendants’ claims for preservation on behalf of those buried there, some more than two centuries ago. How, then, did an archeologist and art historian from half a world away come to be involved in this unique endeavor? O’Donoghue first walked through the cemetery’s gates seven years ago on a tour led by historian Tina Walzer, and almost immediately came face to face with a grave bearing a name familiar to her; a name she soon linked to her maternal family and identified as that of an ancestor. That encounter gave rise to the idea of petitioning the government to recognize a descendants’ advocacy group to be formed with Walzer, who also had a relative there. Thus, what began as a deeply personal moment set off a journey of discovery that laid bare some of the cemetery’s tragic history and set O’Donoghue on the path of engaging various communities in efforts to repair it. The descendants organized public tours and clean-ups, often with the support of local companies and organizations, the American embassy in Austria, and the country’s Green Party. The cemetery is so large, however, and the destruction so rampant, that the group thought it called for a larger public action. On November 1, 2013, a day before most Austrians traditionally visit graveyards to celebrate All Souls Day, O’Donoghue and Walzer opened the doors of the Währinger Jewish Cemetery and invited any and all to come in and help in whatever way they could. That morning, a leading Austrian radio station announced the action and the open invitation. The response was above and beyond what anyone could have expected. Beyond the sheer number of participants, says O’Donoghue, it was especially significant to see the variety of people who had come to do this challenging and, for many, deeply emotional work. Young and old, men and women of various religious and cultural traditions in the city, had lined up to enter the cemetery, as if they had simply been simply waiting, O’Donoghue says, for someone to give them permission to act. That commitment and enthusiasm shown by the groups and individuals who assembled last November at the cemetery’s entrance give O’Donoghue hope that there can be a brighter future for the Währinger Jewish Cemetery, even in the face of those who would rather see its troubled history remain forgotten. Plans are underway for further clean-ups and restoration work; O’Donoghue’s organization hopes to make the cemetery safe enough to be open and attended to daily, and to establish a memorial in the small prayer house. Still, it remains a daunting task, with full renovation costs estimated in the millions. Access to funding, however, has slowly begun to open up, making what once seemed an insurmountable project increasingly imaginable. For now, O’Donoghue is grateful for what has been accomplished so far, and encouraged by the way her Faculty Fellowship at Tisch College has given her a framework for this uniquely powerful work. As she completes a book on Freud, archaeology, and visual culture, says O’Donoghue, she also finds that the complexities of memory and forgetting that permeate her public work have affected how she frames aspects of her academic pursuits— and vice versa. She has recently proposed a paper to an archaeological congress that will introduce one of her group’s current restoration projects: the preservation of a rare group of graves belonging to Jewish families who settled in Vienna in the 18th and 19th centuries from the Ottoman Empire. Living in the Habsburg capital under the protection of the Sultan, this community chose funerary monuments that attested to a remarkable mix of religious and cultural precedents. Beyond the academic, as O’Donoghue considers the larger implications of what her organization has started to accomplish, she sees the power of public work and collective action as possible antidotes to the destruction that has been visited on the Währinger cemetery for far too long.